A new high-power wireless system was being developed for a pole-mounted outdoor application. The complete system would be enclosed within a plastic clamshell and then mounted outside on utility poles or on the side of buildings. Our clients were concerned about solar heating of the enclosure and of course, the internal heat buildup due to the power dissipation by the electronic assembly. As CFD consultants to this project, our objective was to ensure the highest possible thermal efficiency given the low heat transfer rates from the interior through the plastic enclosure and out to ambient air. The CFD simulation took into account natural convection within and external to the electronics enclosure and the conjugative heat transfer between the ASIC’s and the PCB. Chip lead temperatures were back calculation from the analysis. Our CFD consulting expertise with electronic assemblies allowed us to interpret the CFD results in a logical manner and thereby avoid “false positives” or one might say – unnecessarily over conservative predictions. The biggest challenge to this CFD work was the diurnal cycle since the plastic enclosure acted almost as a black body to the solar radiation. 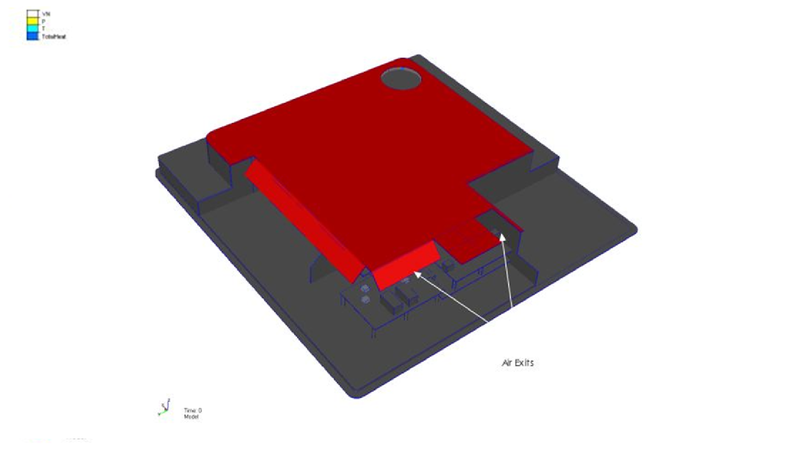 Although internal fans were considered to alleviate the predicted heat buildup between PCB’s, it was reasoned that by mounting the device vertically, a strong natural convection pattern could develop to self-cool the device during hot days. Given the CFD simulation predictions, the electronics assembly was fabricated and tested. 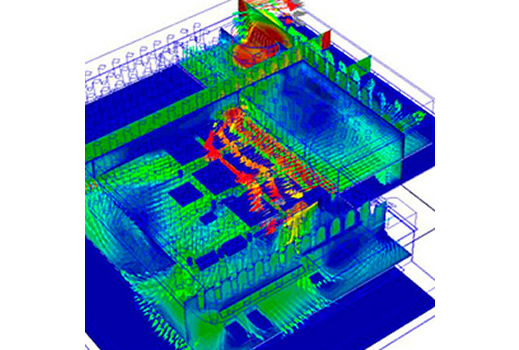 The CFD model was shown to accurately predict its thermal behavior and the device is in production. On our side as CFD consulting engineers, the validation of a simulation model is a big thank you. Within the plastic enclosure, natural convection was simulated to capture the thermal gradients driven by the power-dissipating chips on the PCB. The CFD simulation showed that the majority of the heat transfer was driven by natural convection and not through PCB conduction. These CFD results were crucial in the interpretation of the thermal flow behavior within the system, as CFD consultants, our understanding of the flow pattern led us to avoid the use of internal fans and place internal baffles to direct the air flow toward the hotter chips. Summary: CFD results from this simulation were used to successful drive their design to a lower cost solution, that is, no internal fans. This device has gone into production and the results have been validated as correctly indicating the internal temperatures of the electronic package.